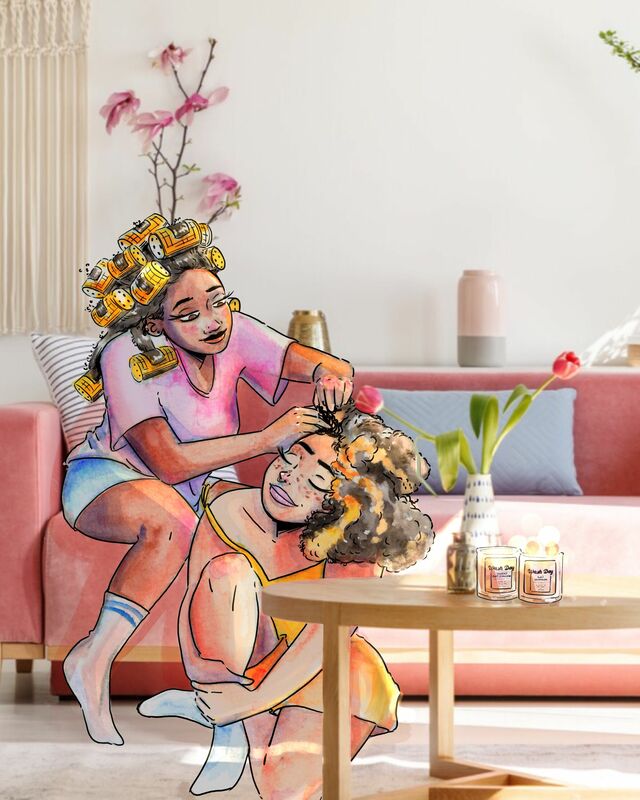 After a successful Kickstarter for her comic Wash Day, Jamila Rowser is back with another great idea– candles inspired by the characters from the comic, Kim and Cookie! We recently had the opportunity to catch up with Jamila and chat a little bit about the campaign. 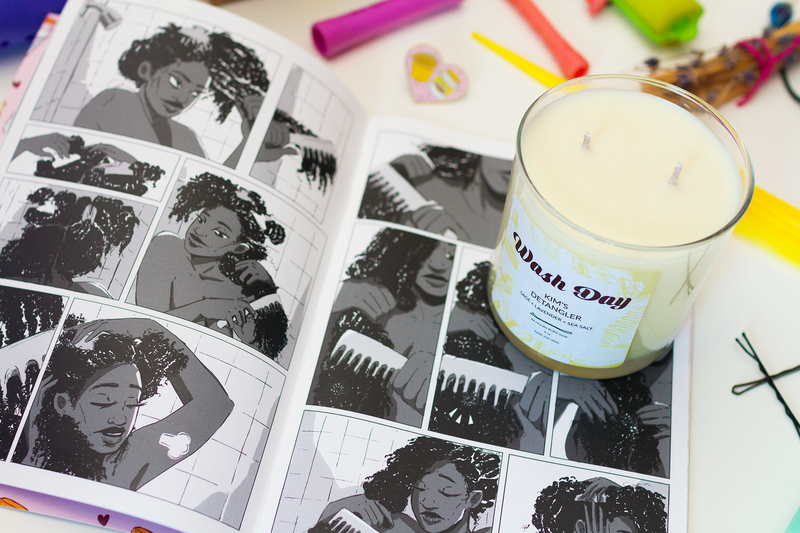 We love the aspect of self-care and creating candles inspired by your comic, Wash Day. What’s your favorite form of self care? The last year or two I’ve gotten into meditation and try to keep up with it, even if it’s for literally one minute a day. I’m always busy so it’s important for me to make time for myself to do just sit in silence. I also love to light a candle and read comics in my bed. Do you have a favorite candle scent? I’m obsessed with lavender, so when we were creating these Wash Day candles I knew I needed lavender to be in included. I really do love both of the candles we created for Wash Day, they both help set a unique atmosphere in the room and home that I really enjoy. Kim’s Detangler has a soothing and cleansing effect with its Sage + Lavender + Sea Salt, while the candle Cookie’s Root Stimulator has the invigorating Lemongrass + Verbana. We loved Wash Day! Got any new comics/writing plans on the horizon? Thank you! After Wash Day I released a sci-fi twerking tale called Wobbledy 3000 with artist Sabii Borno. It’s like Insecure meets The Fifth Element. It was a lot of fun! I’m also working on the script for another comic so stay tuned! I recently finished watching Hunter x Hunter and I loved it so much. I’m a sucker for anime with strong friendships and sweet, strong boys like Gon. I really brought me a lot of jon. 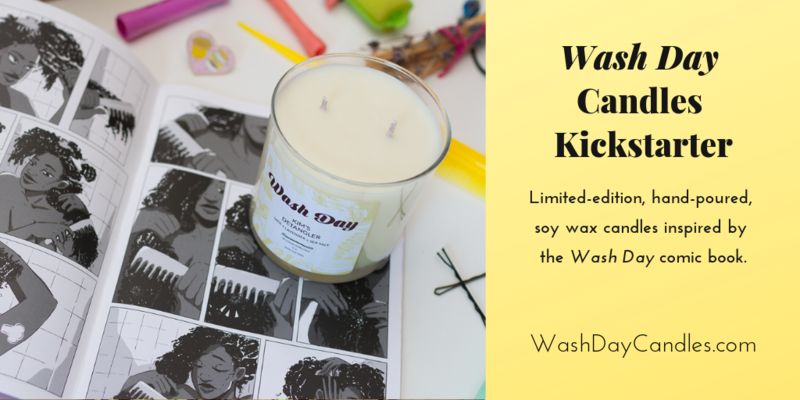 I’m collaborating with the incredible candle company, Pontie Wax, to create hand-poured, scented, soy wax candles inspired by the characters from me and Robyn Smith‘s comic book, Wash Day. Wash Day is a slice-of-life comic that pays tribute to the beauty and endurance of Black women and their hair. We are raising funds through Kickstarter to produce these limited-edition candles and a gorgeous art print by Robyn. 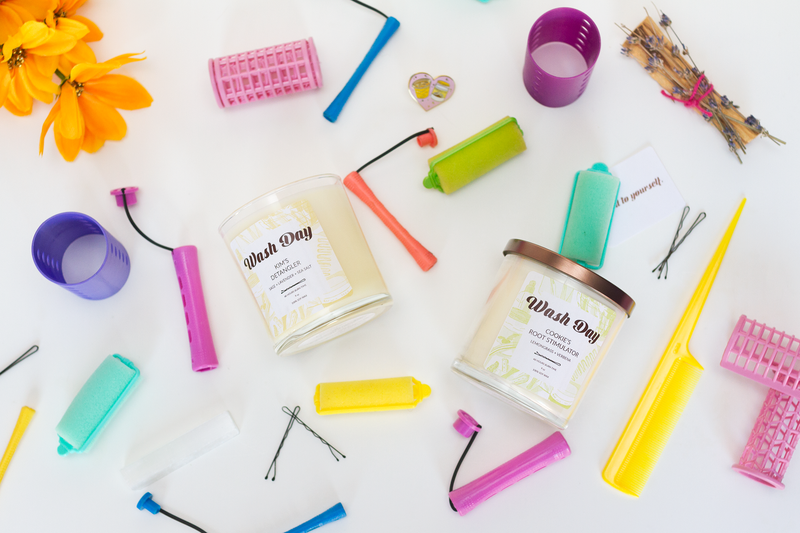 These delightful candles will not only fill homes with wonderful fragrances, but the success of this campaign will also help grow three Black-woman owned small businesses. The Kickstarter campaign will run until February 15th, perfect for a little self love this month!